The ballast tanks will each hold 290 litres of seawater. The plywood MUST be PERFECTLY waterproof. Epoxy resin is the man for the job. 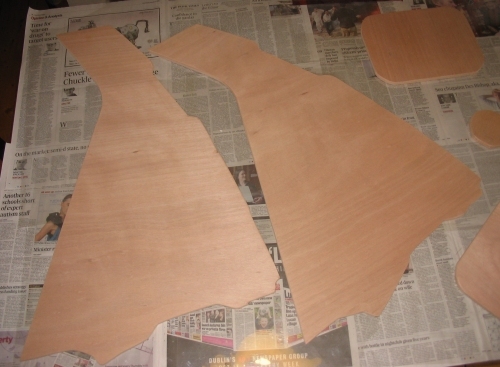 Here the bulkheads and inserts are on the workshop table, sanded, dusted, cleaned with acetone. The table is covered with newspaper, but also several large sheets of acetate (from a friend’s printworks). Epoxy will not stick to the acetate, meaning we don’t have to worry about drips or overflow 0r the newspaper stuck to the underside after coating. 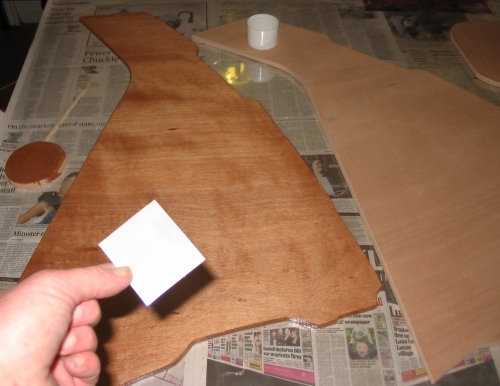 A plastic squeegee is used to spread the epoxy evenly over the surface. The panel at left has been coated. Room temperature of 20 degrees C permits three layers in a single day. 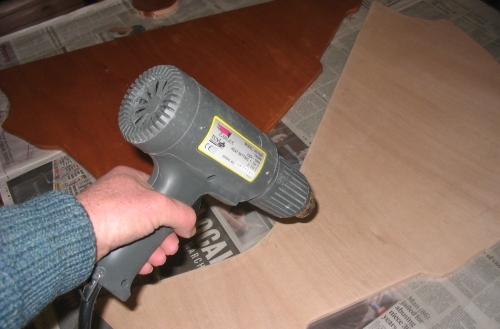 It is good practice to heat the plywood using a hot air gun to prevent “outgassing.” The gently heated plywood will draw the cooler epoxy resin into itself as it cools. 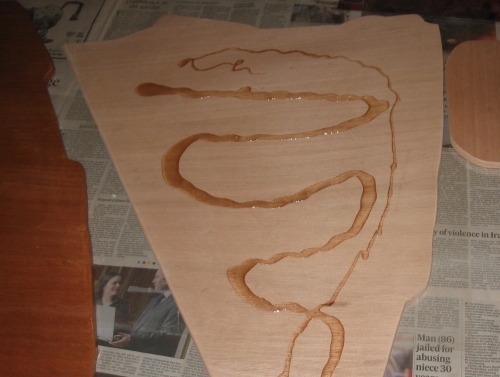 Otherwise, bubbles will form as trapped air molecules in the ply try to escape. 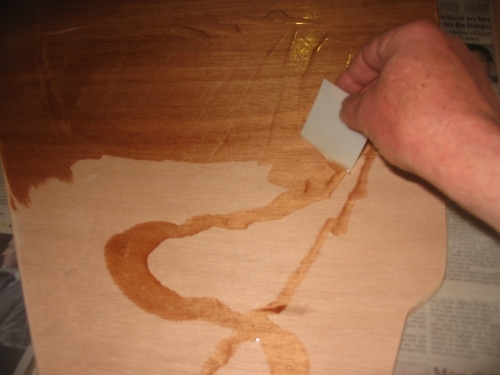 The mixed epoxy is simply dribbled over the ply and then spread with a stiff squeegee. The squeegee in use, after coating, wait a couple of hours and do the second coat, then after two or three hours (20 deg C) the third and final coat. This entry was posted	on Thursday, March 13th, 2008 at 6:31 pm	and is filed under Ballast Tanks.